As co-owner and Director of Investments of Gilliam Mease Advisors, Ben helps guide the firm’s investment policies, chairs the internal investment committee, and contributes in directing the firm’s operations. Ben also counsels his own clients in making wise financial decisions. Ben’s experience in investments and financial planning prior to Gilliam Mease Advisors comes from Merrill Lynch, Fifth Third Bank, and Stock Yards Trust Company. Private real estate ventures have also helped Ben develop his knowledge and understanding of the capital markets and economy. 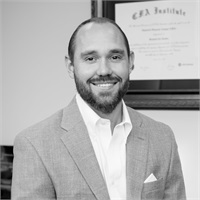 After graduating from the University of Kentucky with two business degrees, Ben continued his education by attaining the designations of Chartered Financial Analyst (CFA) and Chartered Retirement Planning Counselor (CRPC®). Ben also maintains the FINRA Series 7 General Securities Representative license, the NASAA Series 66 securities license, and life and health insurance licenses. Ben and his wife, Amy, have two children and are members of Sojourn Community Church.